Most of us commute to work. Try biking, running, or walking instead of driving to the office. Why not turn a required activity into exercise? Park 15-minutes away from the office if you work far from home. That way, you are still obtaining a 30-minute session of cardio. Exercising during your lunch break can provide the mental break and calorie burn that your body needs in the middle of the day. HIIT can be the perfect lunch break workout routine. You will find a HIIT Tabata class in the afternoon at many Fitness 1440 locations. The workout involves 30-second intervals with 10-second breaks between exercises. HIIT workout are typically thirty minutes. You can burn hundreds of calories within this short time period. Not everyone is a morning person. However, for many of us, the morning can be the only time that you can exercise. Try morning workouts for a week. The payoff can be worth the reward! Multitask your daily chores with exercise. Practice squats or calf raises while you are sautéing dinner. Use the stairs instead of the elevator. Do not take the closest parking spot. Use a stand-up desk. You could burn hundreds of calories more per day just by modifying how you perform chores. Many parents stop exercising when they have young children. There are many reasons why this occurs. You may feel burned out from your newborn, chasing toddlers, or just feel guilty about taking time for yourself. There are methods to combine kid-time with exercising. Take advantage of napping. 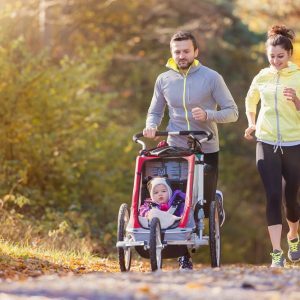 Invest in a jogging stroller. Take a quick run or walk while your child is asleep. When your kids are at the playground, don’t just sit there! Play with them. Take workout classes with your kids, such as yoga, tennis, and even karate. Fitness 1440 offers kid’s fitness classes at many of their gyms. You could also trade workout time with your partner. Your body needs to move! Dedicate energy to your health and you can fit exercise into your life.